A hard wire cutter that is comfortable to hold, easy to squeeze, and has a jaw design which securely holds the wire and employs by-pass shearing action to produce a square cut is available from Xuron Corporation of Saco, Maine. The Xuron 2193F Hard Wire Shear features self-adjusting clamping fixtures that hold the wire perpendicular to the jaws and provides full by-pass shearing action to produce square cuts on both ends of hardened and tempered wire. Capable of cutting 0.064" (14 AWG, 1.6mm) music wire, this hard wire cutter is easier to hold and squeeze than conventional compression-type cutters. Suitable for assembly and maintenance technicians, the Xuron 2193F Hard Wire Shear is ergonomically designed with soft Xuro-Rubber(TM) hand grips, a low-impact return spring, and the clamping fixtures help prevent flying pieces. Providing a high mechanical advantage for superior leverage, it requires approximately 50% less cutting effort than compression-type cutters, claims the firm. 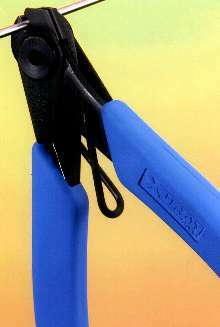 The Xuron 2193F Hard Wire Shear is priced at $ 29.75 (list). Literature is available upon request.